“When the going gets tough, the tough keep going.” This is the Cliff Notes version of a concept known as “resiliency,” the ability to bounce back fast from adversity and reclaim your equilibrium. As a practicing clinical psychologist, I try to build resiliency in my clients, teaching them the skills they need to withstand the inevitable stresses and disappointments of daily life. Why is resiliency so important for writers? Because rejection is part of the game. Like all artists, writers put themselves on the line every time they send out a manuscript, facing judgment from editors and agents. Once the book is published, we face critiques–and sometimes harsh criticism–from readers and reviewers. So much of our identity is wrapped up in “being a writer,” that we risk taking an enormous hit every time a manuscript is rejected or a proposal is turned down. It seems to go to the heart of who we are. How can you build resiliency? I’d recommend ten simple steps. Let’s take the example of finding yet another dreaded rejection letter in the mail. Your first inclination might be to think: ”This is hopeless. I’m a failure, I’ll never make it as a writer.” These dark thoughts that might cross your mind, but they are not accurate. What to do when faced with an apparent setback? Step 1. Take a deep breath. Deep breathing is a proven relaxation technique. Shallow breathing (chest breathing) increases anxiety and clouds your thinking. Here’s a quick hint on how to do deep breathing. Put your right hand on your upper chest and your left hand on your midriff. Now, consciously try to take a deep breath. Your right hand should not move at all, your left hand should move as your midriff expands. It may feel odd at first, but you will quickly master this skill. Step 2. Check your thinking. When people are anxious or faced with a setback, they often make inaccurate assumptions. Three common ones are catastrophizing, black and white thinking and generalizing. Let’s start with ”catastrophizing,” which means putting the worst possible spin on the situation. “This is the end of my writing career. I’ll never sell again.” Sound familiar? People who catastrophize expect the worst-case scenario every time, failing to see a rejection for what it really is: one particular editor didn’t like this particular manuscript. Or maybe you’re guilty of “black-and-white” thinking, and tend to see things as all-good or all-bad. A rejection would be a disaster with this mindset. You would immediately decide that since your manuscript is not “all good” it must be “all bad,” riddled with fatal flaws. People who engage in black-and-white thinking never allow for shades of gray. Another common cognitive error is “generalizing;” looking at one example, or a tiny part of the whole, and making a general assumption. A writer who generalizes might conclude that since this particular manuscript was rejected she is a failure as a writer and that all her manuscripts will be rejected. Step 3. Try for some damage control. Ask yourself: Does the editor really dislike the manuscript as a whole, or can you tweak it a bit, make some changes and salvage the piece? Who knows? It might be a much stronger piece, once you take a second look at it. Is there any way you can incorporate her suggestions into the book? Step 4. Think of past “failures” that led to successes in your life. Have there been other times when you’ve been too close to a situation to see things accurately? Almost everyone can point to an incident or an event that seemed disastrous at first glance, yet turned out well in the end. Maybe the information you learned then can help you now. I have a print of a famous painting in my office that serves as a prime example of keeping perspective. It’s called A Sunday Afternoon on the Island of La Grande Jatte and it’s painted by George Seurat. If you look at the painting up close, it’s merely a series of tiny juxtaposed dots, with no discernible pattern. It doesn’t resemble a scene–it looks as though someone dumped a big box of confetti on the canvas. But if you step back a few feet, suddenly all the painted dots coalesce and the scene takes shape. It’s a quick visual reminder to my clients that distance builds perspective. Step 5. Remember that rejection goes with the territory and ask yourself how other writers deal with it. How do your colleagues handle the emotional distress that you’re feeling? Do they cave, or do they try to remedy the situation? Step 6. Ask a close friend for feedback. It’s always good to at least consider a situation through another set of eyes.. Since your friend is less emotionally invested in the outcome, she may have a totally different–and more realistic–impression than you do. Friends–and organizations like RWA–can help. A new study shows that among women diagnosed with depression, talking to a trusted friend can alleviate depression in over sixty percent of the cases. The value of a confidante cannot be overstated, especially if your trusted friend is also a fellow writer. Step 7. Try to reframe the situation. Yes, the editor may not like this particular manuscript, for whatever reason. It may have nothing to do with your talent, or the quality of your work. If may be she’s just bought a book with the same theme, or that the market is flooded with similar books. Try reframing the situation in a more positive light. Caridad is right. Taking action always helps. So here’s my prescription for the heartache and rejection that all of us writers face: Do something right away to get your career back on track. You can polish up another proposal, start something new or spend two hours in a bookstore, checking out the new releases. Action leads to power, and a sense of control, which makes for a happier outlook. You will find that you are more resilient than you thought! Mary Kennedy is a national best-selling author, and a clinical psychologist in private practice on the east coast. She has sold forty novels, all to major New York publishers, and has made the Waldenbooks, BookScan and Publishers Weekly best-seller lists. 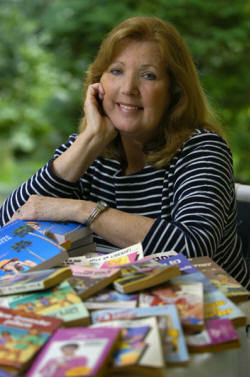 Her early novels included middle grade fiction and young adult fiction for Scholastic and Penguin. Currently she’s writing an adult mystery series, The Talk Radio Mysteries, which is set in a fictional town in south Florida. The first title, DEAD AIR, was released January 2010, the second, REEL MURDER, appeared June 2010, the third, STAY TUNED FOR MURDER, January 2011. The Talk Radio Mysteries was pitched and sold as “Frasier Meets Murder She Wrote.” The heroine is Maggie Walsh, a psychologist who closes up her Manhattan practice and heads to sunny Florida to take a job as a radio talk show host. And, yes, she solves a murder in every book! As a former radio copywriter and a practicing psychologist, Mary is uniquely qualified to provide realistic background for her books – although she hasn’t personally solved any murders ;-). Mary’s favorite vacation destination is South Florida and she makes an annual winter pilgrimage to Fort Lauderdale. Mary won an award from the National Endowment for the Arts for “artistic excellence in literary fiction.” A popular workshop presenter, she has spoken at over a hundred conferences, libraries and schools, all over the country. She also has written articles for PW, NPR, BookPage Gannett, RWR, and other industry publications. When not writing, speaking, or traveling to exotic locales, she lives with her husband and eight neurotic cats. The cats have resisted all her efforts to psychoanalyze them, but she remains optimistic.